Habitat: Elecampane is native to south-east Europe, central and western Asia. It grows best in damp soils and pastures, forest edges, plains and hills. 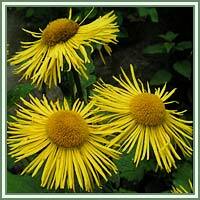 Description: Elecampane is a herbaceous, perennial plant, growing up to 1.5 meters long. It has a strong rhizome, and an erect, stout and deeply furrowed stem, branched near the top. Leaves are large, ovate and pointed, toothed along the margins. Elecampane is in flower from June to August. Flowers are borne in large terminal heads. They are yellow-rayed, on long stalks, resembling small sunflowers. Useful components: Inulin, triterpene saponins, sterols, polyacetylenes, volatile oil. Medicinal use: Elecampane is considered to have bactericidal, antitussive, expectorant, cholagogue and tonic properties. 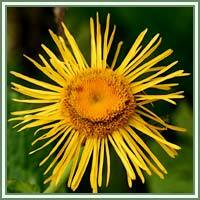 Elecampane has been long regarded as extremely beneficial for the respiratory system. It clears the chest from mucus accumulation and warms the lungs. It is a very beneficial respiratory tonic, and an effective remedy against chronic bronchitis, bronchial asthma, flu and tonsillitis. The plant is also used as a digestive stimulant. It promotes appetite and alleviates dyspepsia.